According to Consumer Intelligence Research Partners (CIRP), Amazon received over six million new members during the second half of 2018. As Q4 came to a close, Amazon’s growth reached record-breaking heights. Last year, in a letter to shareholders, Jeff Bezos revealed an official Prime count of 100 million, but in a recent study conducted by CIRP, Amazon acquired another one million Prime Members in the last six months of 2018. Despite being one of the largest publicly traded companies in the world, this retail giant keeps its internal metrics close. From this 101 million, Amazon did not share exactly how many Prime members it has by country – the membership count includes all Prime members globally. While Prime numbers have been slowly rising for the last decade, CIRP estimates that Amazon membership growth is slowing. Prime membership is the lifeblood of Amazon. Prime members spend more money and shop more often than customers without Prime. On average, customers with Amazon Prime spend an average of $1,400 annually on Amazon, while non-Prime customers spend about $600. As of 2019, 62% of Amazon customers in the United States are Prime members and around 80% of U.S. households utilize Prime. 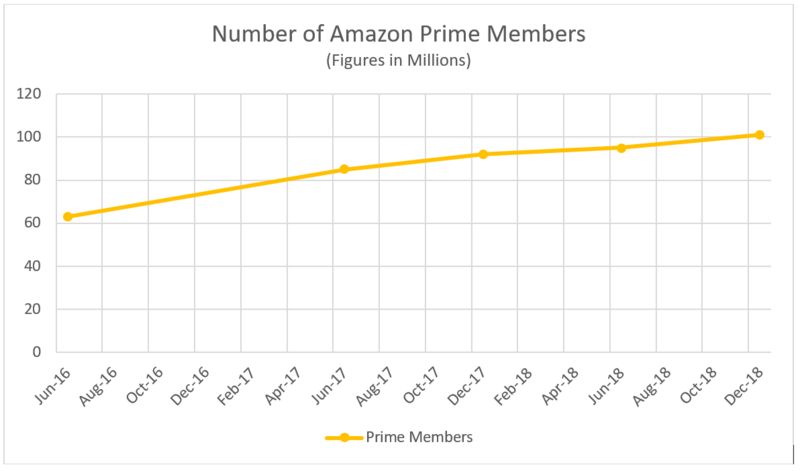 Due to the large number of customers who are already Prime members, the Amazon Prime growth rate is reaching a plateau. New sign ups in the U.S. are projected to slow down to 10% growth year over year.